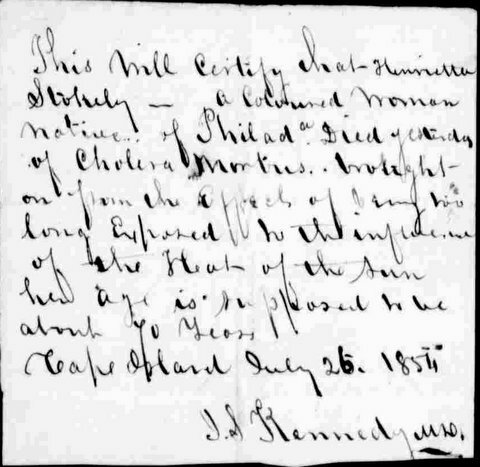 Seventy-year-old Henrietta Stokely died this date, July 26th, in 1854 of Cholera and was buried at Bethel Burying Ground. Ms. Stokely was vacationing at Cape Island, NJ (now Cape May)and contracted Cholera. The doctor who wrote the death certificate believed Ms. Stokely caught the disease from prolonged exposure to the “Heat of the Sun.” Even for 1854 this was quackery. Mainstream medicine at the time believed the disease was caused by miasma or exposure to an unpleasant smell or vapor. Perhaps similar to the smell of a decaying corpse or rotting fruits or vegetables. It wasn’t until 1884-85 that science was able to identify the Cholera bacteria as the source of the deadly illness. The disease was commonly brought on by drinking water contaminated by the feces from a person who already had the Cholera bacteria. The bacteria could also come from raw or undercooked fish and seafood caught in waters polluted with sewerage. The crippling symptoms of Cholera came quickly, first diarrhea and vomiting, abdominal cramps, shock, then death. Harriet Tubman worked as a cook in Cape May in 1852, earning money to help runaway bondsmen. She developed fugitive slave routes in Salem, Cumberland and Cape May counties, including obscure Indian trails. – See more at http://www.capemay.com/blog/2001/09/cape-mays-role-in-history-pathway-to-freedom/#sthash.97naePSS.dpuf.